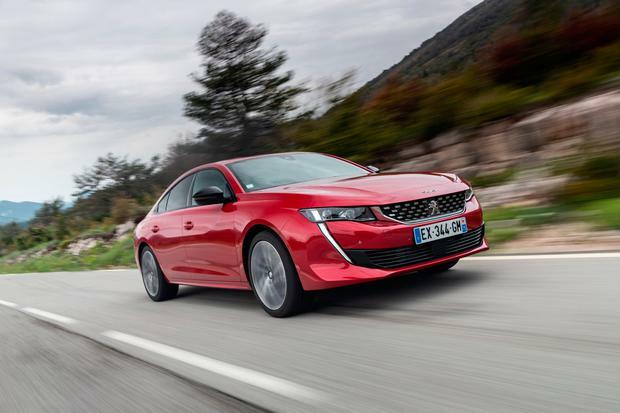 Peugeot has just announced price and spec levels for the new 508 large-family fastback. That is for the Active 1.5 BlueHDi 130bhp model. Standard across the range is a five-year extended warranty. There will be four trims: Active, Allure, GT Line and GT. And there will be two petrol and four diesel engines depending on the trim. The petrols are a 1.6THP 180bhp automatic 8spd S&S and a 1.6 THP 225bhp auto 8spd S&S (GT only). The diesels include a 1.5 BlueHDi 130bhp 6spd manual S&S, 1.5 BlueHDi diesel 130bhp auto 8spd S&S; a 2.0 BlueHDi diesel 160bhp auto 8spd S&S; and a range-topping 2.0 BlueHDi diesel 180bhp auto 8spd S&S. Standard equipment includes i-Cockpit with 8ins touchscreen, compact steering wheel and heads-up digital instrument panel, Mirrorscreen connectivity, 16ins alloys, spare wheel, lane keeping assist, cruise control, speed limiter, active safety brake, AGR (ergonomic) seats, visibility pack (automatic wipers, lights), visiopark 180 (front, rear parking aid with camera), electric folding mirrors. Allure level-three models cost from €34,930 and add a 10ins touchscreen with sat nav, blind spot monitoring, high beam assist, road sign recognition, 17ins alloys and 2 USBs in the rear.